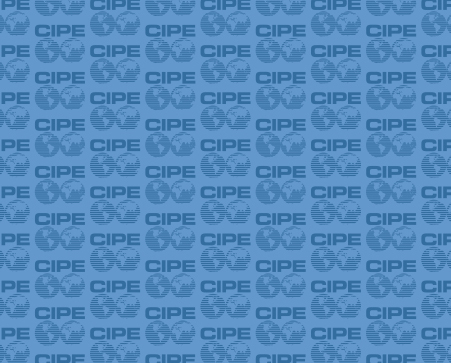 To help local companies and multinationals working in Pakistan deal with this challenge, CIPE Pakistan initiated a discussion on issues related to supply chain compliance in multinational companies. In collaboration with the Overseas Investors Chamber of Commerce & Industry, CIPE conducted a first focus group meeting of the Value Chain-Unethical Practices project. This first meeting was used to conduct a gap analysis, focusing the capacity building needs and the given standards in Pakistan. Top supply chain officials from different multinationals attended this meeting. The key discussion centered around the compliance practices of vendors, suppliers, lack of training, non-compliance with the laws, and other issues which affect industry, business, economy, and society as a whole. The participants took great interest in the conversation and discussed in detail the challenges they face in compliance. They expressed their concerns about the rampant corrupt practices while admitting their weaknesses in overcoming the problem. Companies with limited internal capacity to deliver training programs said they often find it challenging to reach out to all vendors, particularly for post-training audits. Participants suggested the need for a database of certified vendors who have gone through a recognized value chain compliance training program in Pakistan. It was agreed that this initiative will establish new standards of corporate compliance and business integrity and promote international standards, enabling companies to train their staffs to implement reforms and verify the coalition standards. Non-compliance with industry norms, lack of training, checks and balance, and absence of vendor knowledge are the key challenges in implementing supply chain legislation. A majority of the companies do not conduct vendor supply chain training programs. All companies have lack of internal capacity to run training programs. A majority of companies do not have an internal knowledge repository related to supply chain compliance. Extra cost and documentation, unethical practices by vendors, lack of compliance training, and transparency through businesses are the major growing concerns for the respondents. Companies also stressed the need to establish a forum where lawmakers and companies could come forward to resolve prevailing issues of value chain compliance. At the next meeting, responses will be considered to conduct a gap analysis, focusing the capacity building needs and the given standards in Pakistan. The outcome of gap analysis will be discussed and finalized in second focus group meeting. Muhammad Talib Uz Zaman is a Program Officer for CIPE Pakistan.